Almost everything that appears in our newsletters can be found on our this site. We have a really great site search feature, powered by Google, that makes it easy to quickly find the tip, trick or answer you’re looking for. 1. Look on the right side of this page, near the top. You’ see there’s a site search feature (highlighted in yellow below). 3. 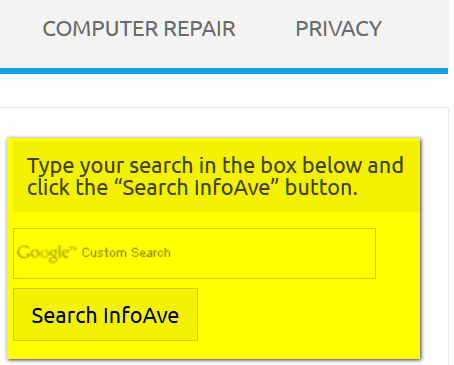 In the search box type what your looking for and click “Search InfoAve”. 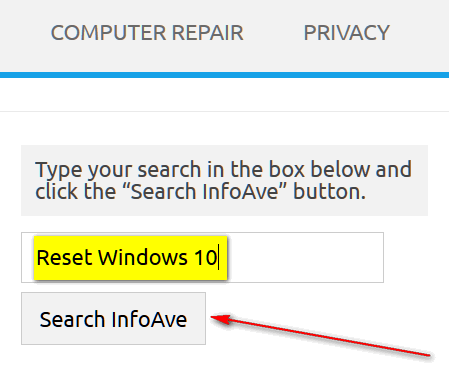 As an example, above, we’re going to search for how to “Reset Windows 10”. 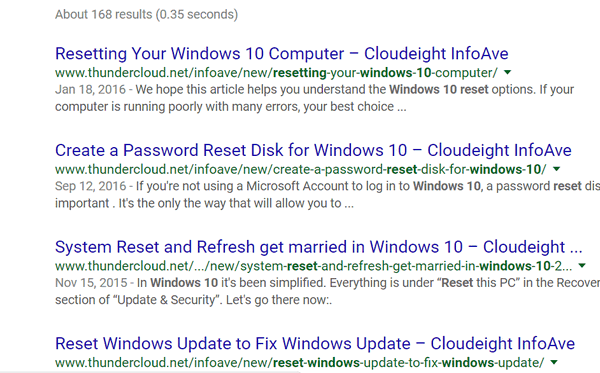 In less than a 1/2 of second (0.35 seconds to be exact) we found several Cloudeight articles on Windows 10 Reset options. Here are the few articles our site search turned up for the query “Reset Windows 10”. So, the next time you need to look up a tip, trick or answer quickly, try our Google-powered site search. We’re pretty sure you’ll find what you’re looking for in a jiffy… we tells ya! Wow, thanks, I am always searching for help. I told you that you are my hero!!! I had no idea I could search like that!. I guess it’s true that you are never too old to learn….and YOU know how old I am~. The answer to an octogenarians prayer. Thank you so much from Australia. Another old fart who need a prayer occasionally here in Nova Scotia. Thanks Folks. All the way from South Africa. Many thanks for the great hints from little New Zealand. Now this is cool. Thanks for the tip. I tried this tip. I thought it was confusing to get to. My concern is this: I have a scanner on my printer. When I put “scan” in the searchbox, all I got was information on how your computer could scanned for viruses or how to scan your computer. I have things I want to scan and print, but I’ve yet to find any info on how to do this. My HP info doesn’t help either. Where would find this info? We seldom write tips on hardware such as printers/scanners. There are so many brands and models, it would be impossible. If you need help with scanning, contact the information that came with your printer/scanner, or lacking that contact the company who made your printer/scanner.